Context: I’d never heard of this book until my friend Stephanie gifted it to me for Christmas last December. 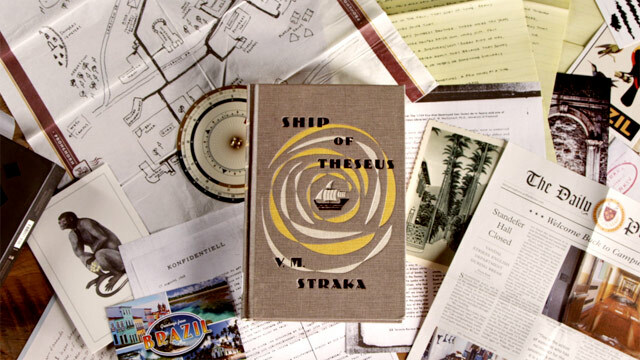 The structure looked fascinating: an old book (Ship of Theseus by VM Straka), written all over with marginalia, and filled with inserts (letters, postcards, napkins, photos, newspaper clippings, etc). I was told by several people that because this is multiple stories, and the marginalia is nonlinear, it would take some concentration and time to read. Stories: 1 – Ship of Theseus, the internal printed narrative by VM Straka, is an allegorical adventure tale questioning identity and the meaning of political cause. 2 – The identity of Straka is a mystery, and the authorship of the book (as well as all Straka books) is highly debated by scholars. 3 – SoT is translated and footnoted by another mysterious person named FX Caldeira. Considerable debate also exists as to Caldeira’s identity and relationship to Straka. 4 – The owner of this particular copy of SoT is a disgraced grad student named Eric. He is the original note-taker in the book. 5 – Jen is a college senior undergoing an identity crisis as she approaches graduation, and happens upon this book and Eric’s notes. 6 – Jen and Eric’s individual stories collide as they begin to write notes (both related to the text and not) back and forth in the book, and then their stories slide into that of Caldeira’s, Straka’s, and the mysterious S complex (which may or may not exist). Got that all? Methodology: There are many possible ways to read this. My method was to read the printed text of SoT in sections, ending at page-ends or section-ends, and then to read the marginalia/inserts that went along with it. After finishing the book, I went back and reread all the marginalia/inserts, after I (basically) understood Eric and Jen’s story/stories. Structural Impressions: The format of this book immediately struck me as similar to several books that I’ve experienced over the years. First and foremost, I’m reminded of Pale Fire by Nabokov, where the internal poem is annotated to tell the story of the annotator through footnotes. Second is Dash and Lily’s Book of Dares, where two people communicate through letters in a book. Third, the interactive format reminded me of the Miss Peregrine series, albeit far better accomplished in my opinion. Lastly, by the end of the book, I was really struck by the similarity to AS Byatt’s Possession in the way that two academics are pulled into each other’s worlds by the story of writers/lovers in the past. Marginalia/Inserts: I enjoyed how these stories unfolded over time. Jason asked me when I was about a quarter of the way through the book if the marginalia was believable as marginalia, and I had to say both yes and no. There seemed to be less commentary on the text itself than I would have expected (especially from Eric, pre-Jen), and the story progressed far more linearly than I would have expected as well. As time passed, the pens used by the two writers changed colors, so it was easy to follow the progression. However, I would have expected there to be equal amounts of older-pen notes in the second half of the book as the first, and the same with newer-pen notes in the first half. An even distribution certainly would have made the book harder to follow, yes, and so I don’t begrudge the order, but it wasn’t altogether realistic as marginalia. There was, however, a good balance between scholarly research, literary speculation, and random conversation. Eric and Jen: I loved reading the story of the two students who came to know each other over time. I really love stories like this, and watching how relationships develop. Perhaps this is simply because I’ve had several longterm good friendships and relationships develop over letters; I don’t know. There’s something about it that appeals to me, though. By the end of the book, I wanted more from Eric and Jen, wanted to know a lot of the details that, because their story is told through marginalia, we never get. 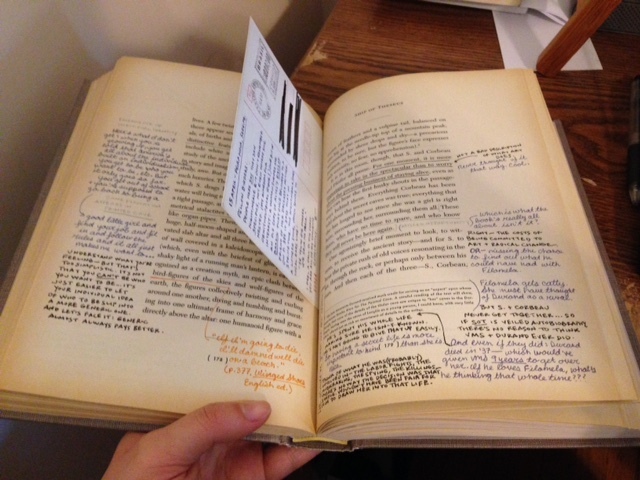 There were places I wished the book was not told through marginalia purely because I wanted more from their story. In the end, though, I think their story was more special for the way it was told, and I realize in writing this review that Eric and Jen don’t feel like characters to me because of the book’s structure. They feel like real people, and like I get to be a researcher in my own way, putting together details to imagine the rest of their lives behind the page. It reminds me a bit of a series of photos I found lying on a beach once in Georgia, in 1998 (left). It was a series of four photos spit out from one of those cheap photobooths that sit in malls, all connected in a long strip, showing a man and a woman. They were in different poses in each one, and the strip itself told a story. I kept that strip, gave the man and woman names, and made up a story to go with it. This is how I feel about Eric and Jen: that their story is theirs, but also mine in some ways. It’s the ultimate definition of interactive media, I suppose, and what I feel is the real genius behind S.
Conclusion: Definitely worth the effort of reading, and satisfyingly pleasing in an academic way. This entry was posted in 2015, Adult, Prose. Bookmark the permalink. This sounds amazing, especially for its unique structure. If I were to read this or one of the books you recommended as similar, which would you recommend? I will definitely check this one out. And this is yet another reminder that I must read Pale Fire. I confess that I did not make it through S. I read about the first quarter of the book, but it just didn’t come together enough for me. Beyond the gimmicks, which I liked, I just didn’t feel there was much there there. I thought most of the gimmicks had been done to better affect in Possession and in the Griffin and Sabine books which were popular in the 80’s/90’s. In my experience with marginalia, back when you could still buy second hand books that had it, there is lots and lots in the first half of a book, with less and less as you went on. Have you tried House of Leaves? It’s a very spooky book with lots of visual print tricks at play. I thought it was terrific. I’ve had that experience with marginalia as well, though it seemed like it wouldn’t be the case in S, since these two people were studying this book especially – one for a thesis, you know? Plus, there wasn’t less as they went along – the time of the characters just went along the pages of the book, which was a bit odd. I don’t believe I’ve heard of House of Leaves. I’ll go look that up.